At yesterday’s Devon show it was great to have so many fragrant orchids on our display. One of them was this lovely species which fills the whole of Warm Americas with its delicious play-doh scent. 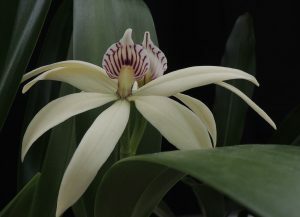 The species is found over a wide range through Central and South America and forms a large plant with 40 cm pseudobulbs topped by 40cm leaves. The flowers are almost always in pairs, back to back but we get threes on particularly strong growths. Found from 400 to 1700m the plant is not fussy about temperature and we grow it well in both Warm Americas and Cool Americas keeping it damp all year. Growing the species in different temperatures extends the flowering season as the warmer growing plants flower first during May while the cooler growing plants wait until June.